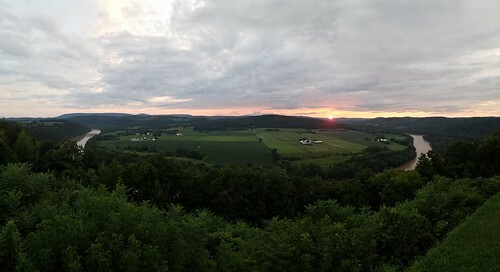 Pennsylvania is unique for all its hidden gems, places that few know exist. One such place is Huckle Run in SGL 134, near Hillsgrove. 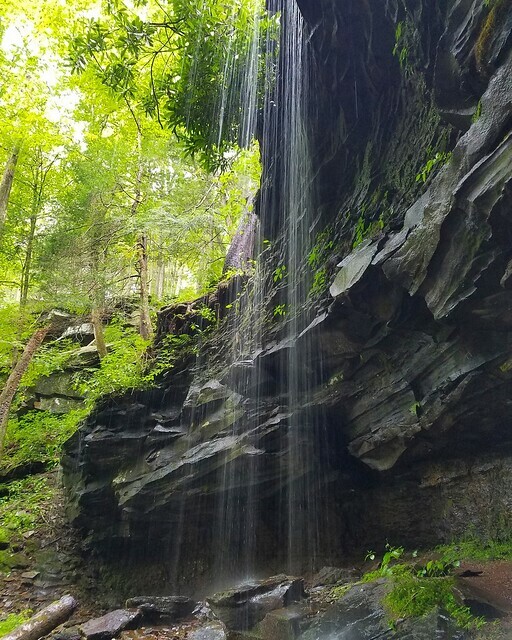 Huckle Run carves a gorge of incredible beauty through the plateau, creating six waterfalls, grottos, pools, and old growth trees. There are countless cascades and the water is incredibly clear. 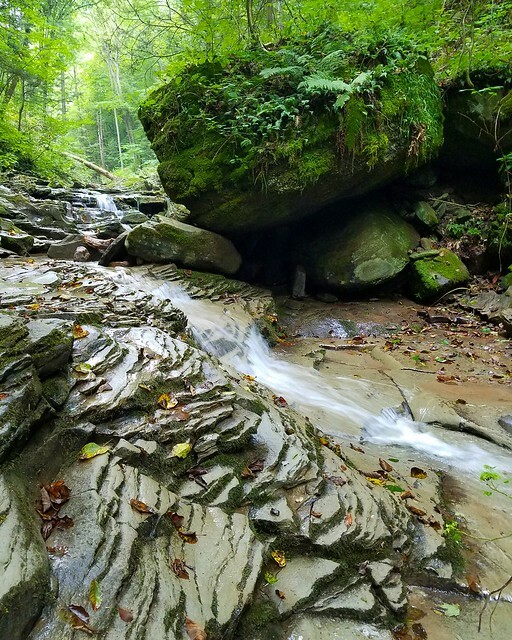 Huckle Run is like a smaller version of the popular Rock Run near Ralston in the way it has sculpted the bedrock. 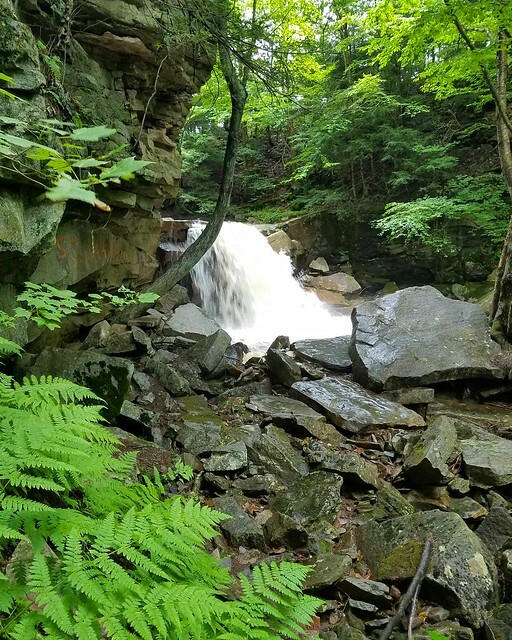 Please note that while most of this hike is on SGL 134, three falls are on private land, which was not posted on our hike. 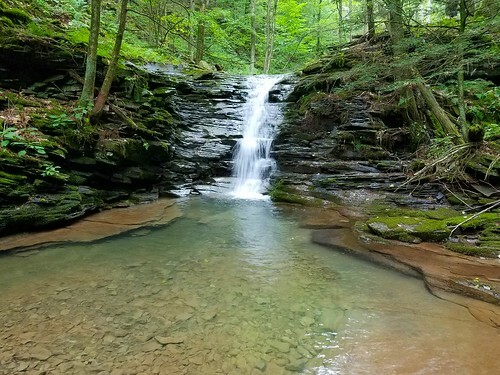 One falls is along the border with the game lands. I believe this was land that once belonged to Camp Lycogis, a girls scout camp that is now closed. If the land becomes posted, please do not trespass. There is also an old grey blazed trail system. The blazes are faded, the trails are largely overgrown, but they can be followed with some effort. The GPS indicated this hike was 13 miles, which seemed too long, but it is a rather circuitous route. We began at the parking area and took the gated road to the left, which curved left passing meadows and hemlock forests. A small creek soon joined this gated forest road and descended into the gorge. Where the gated road veered left, or north, we turn right into the woods at a cairn and descended. This part of the hike was off trail. It was easy to traverse the forest due to the hemlocks. We soon came Huckle Run and a five foot falls. Upstream was a ten foot falls and an impressive gorge with cliffs. The beauty was outstanding. We then climbed the north rim of the glen, where there was a grey blazed trail. We looked down into the stunning gorge. 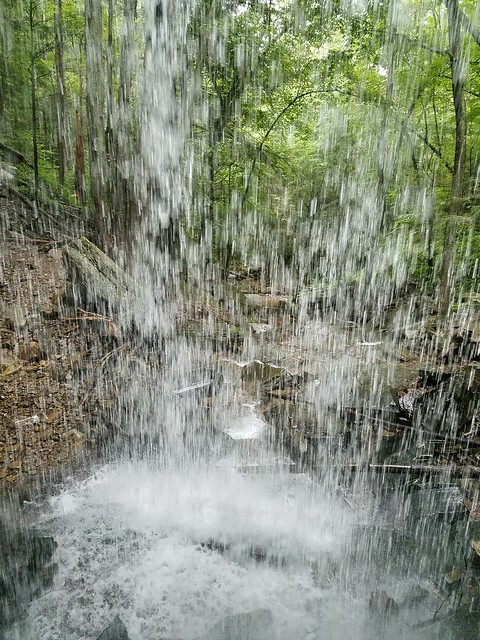 A 15-20 foot falls came into view, the tallest on the creek. It tumbled into an inaccessible gorge. Oddly, we entered this gorge by descending the falls itself as the bedrock offered good traction. We explored this gorge with its pools and cliffs. We climbed back up the falls and continued upstream to a unique falls set in a narrow chasm with a deep, translucent pool. We then followed the grey trail south through scenic forests. We reached a four-way intersection that was a little confusing, but we soon found a trail heading south that followed along the top of ledges. 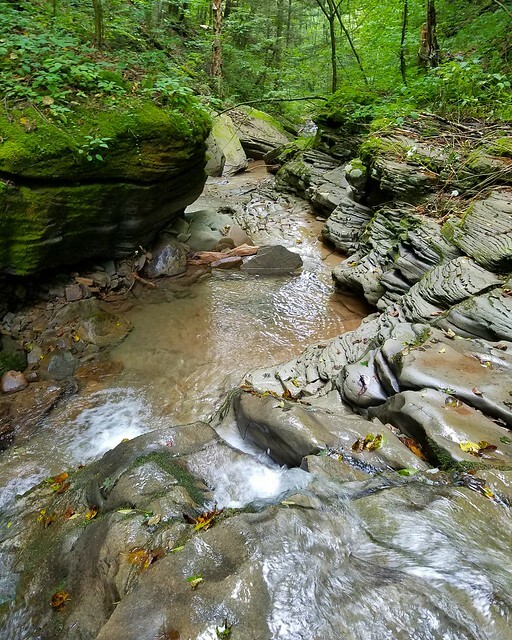 We descended to the Loyalsock Creek at a bedrock ledge and a deep pool. The trail then climbed to the Lower Vista, which offers a good view from a cliff across the valley. While nice, it is not a must-see on this hike. The trail then stayed level across the contour of the mountain, featuring more hemlock. We reached a Y intersection and followed left as the climb steepened through some brushy areas. It leveled and reached an intersection; be sure to turn left to see the High Vista, which is a must see on this hike. 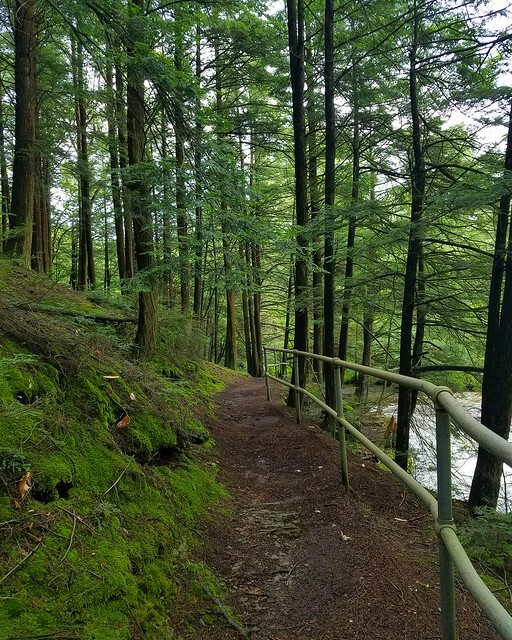 This trail was more overgrown as it ascended through scenic forests and veered right along the rim of the plateau, passing the top of a possible seasonal falls in high water. 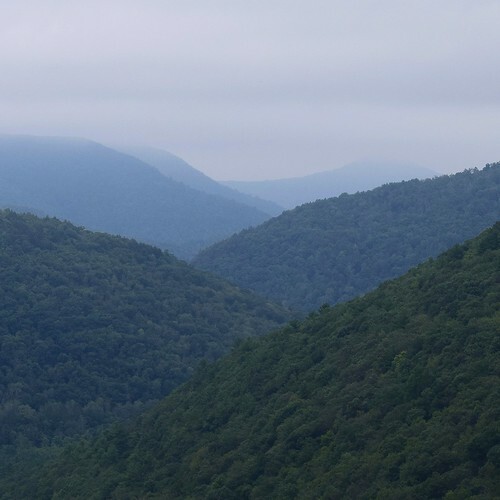 The trail dropped to the edge of the plateau at a dramatic cliff and a superb view of the narrow, rugged Loyalsock Creek Valley. Smiths Knob looms in the distance. The view is about 700 vertical feet above the creek. This is a real cliff, so be careful at the edge. A fall would be fatal. We retraced out steps and continued on the hike as it dropped down the Huckle Run with more hemlocks. The trail turned right above the run, following an old grade down to the last falls we saw. Another trail, following an old grade, turned sharply upstream. 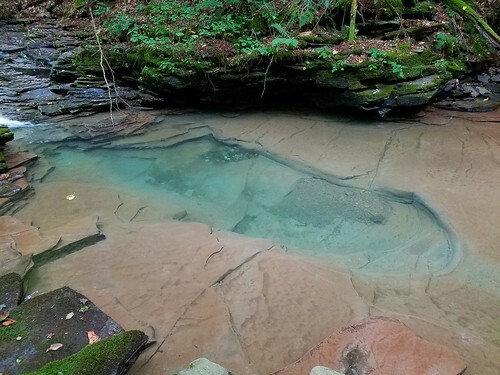 However, we just hiked up the creek, passing stunning bedrock pools and slides over layered sandstone. We reached a twelve foot falls and continued hiking along the creek, even though the grey trail was just above us. 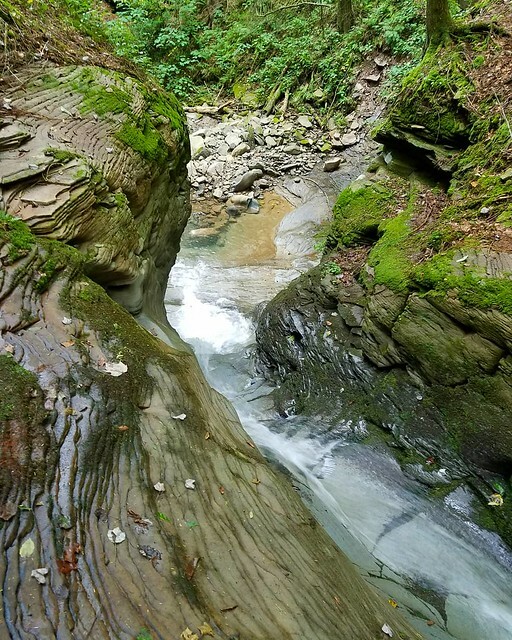 We entered an incredible gorge with ledges and giant boulders clothed in moss and ferns as the creek tumbled over beautiful tiers of bedrock. I found this spot to be uniquely beautiful. Fallen trees in the creek slowed our hike. There was some flood damage with small landslides and washouts. We turned a corner and reached the final falls, which I call Gahonga Falls. 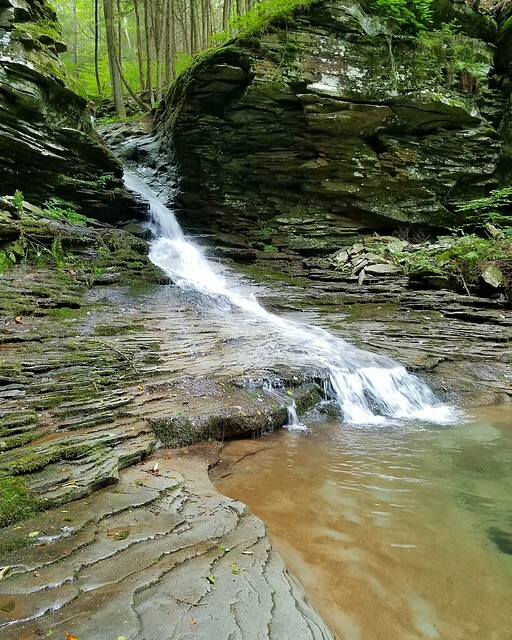 This is the most beautiful falls on Huckle Run at its is so graceful and has carved into the bedrock with oblong pools and mossy ledges. 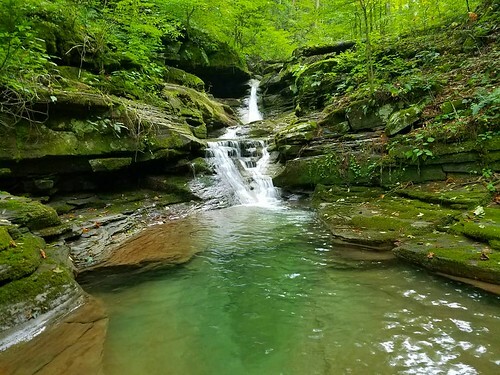 We saw trout at this falls, which is named after invisible nature spirits in Iroquoian mythology that lived in caves along streams and would test their strength against each other. A fitting name since there is a small cave at the top of this falls. Our hike continued up the creek. We noticed a grade ascending to our right/north. We took it and returned us to the original gated road we hiked in along. This juncture makes this hike easier, and is marked by a cairn. A washout is also nearby. From there, we retraced our steps. 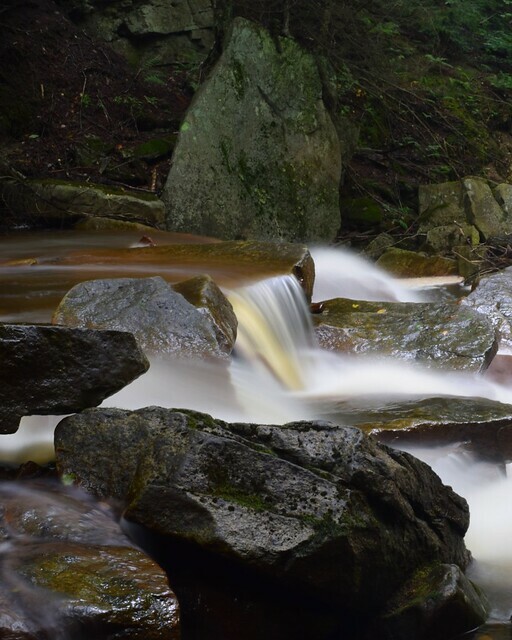 Huckle Run is a place of stunning beauty. Please treat it with respect. 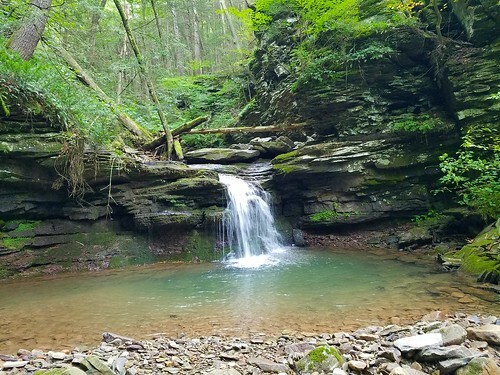 Even if the private land becomes posted, this is still an excellent hike with three falls you can see (including Gahonga Falls), hemlock forests, gorges, big trees, ledges, and the High Vista all located on the game lands. 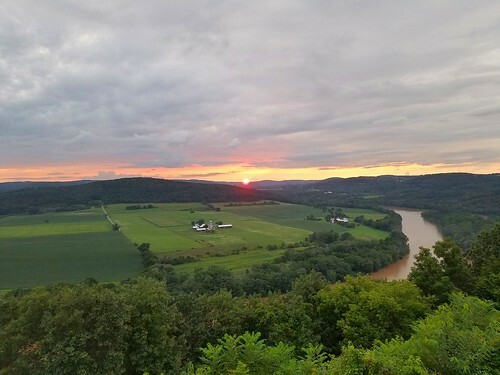 Keep exploring the beauty of Pennsylvania. The parking area is at 41.420913, -76.751686. Thanks to Ben Van Riper for his help with this map. Routes and trails on private land not shown. 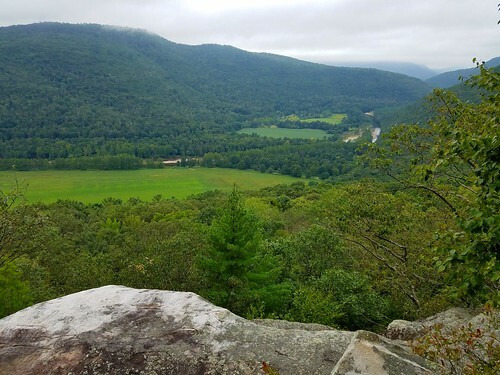 View from Lambs Lookout, Tioga State Forest. 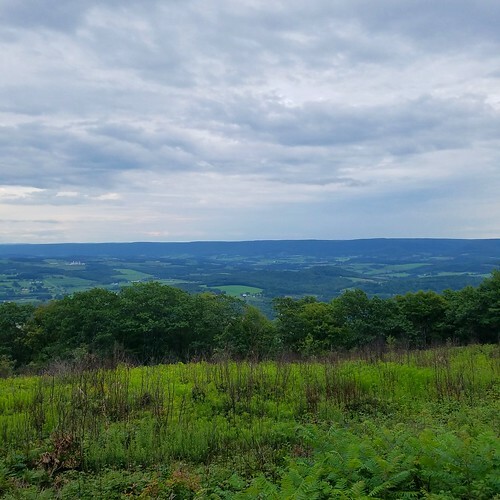 Lambs Lookout, also known as Lambs Vista, is a little-known vista in the eastern end of the Tioga State Forest. For some reason, it is not shown on the state forest maps. It is notable for its fine view to the east, and the fact you can see Elk Mountain on a clear day, an incredible distance of over 50 miles. Vast plateaus rise to the southeast, as rolling farmlands spread out below the vista. This is not a hike, as a road goes to the vista. There is a field and a picnic table. 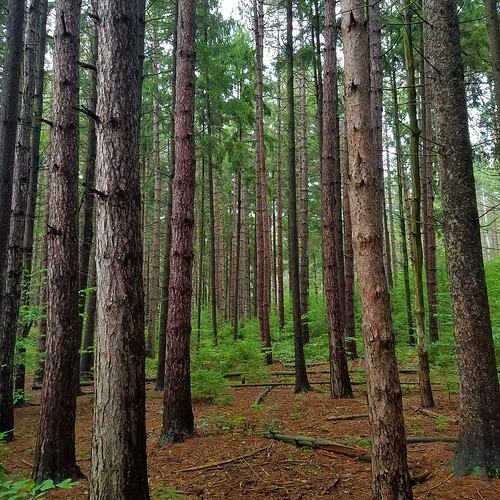 There are spruce forests near the field. A trail does climb to the vista, I presume it comes from the road below. I did not hike it. This is an incredible view for sunrises. The view is located at 41.690172, -76.866366. 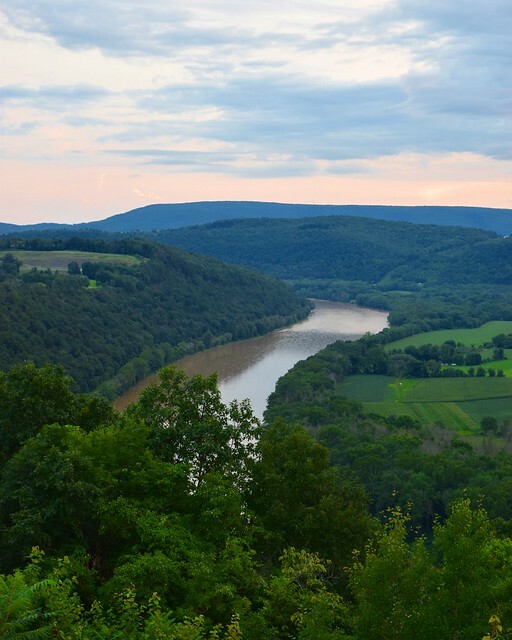 Nestled in an isolated valley along the Tioga River, County Bridge is an ideal place to get away. 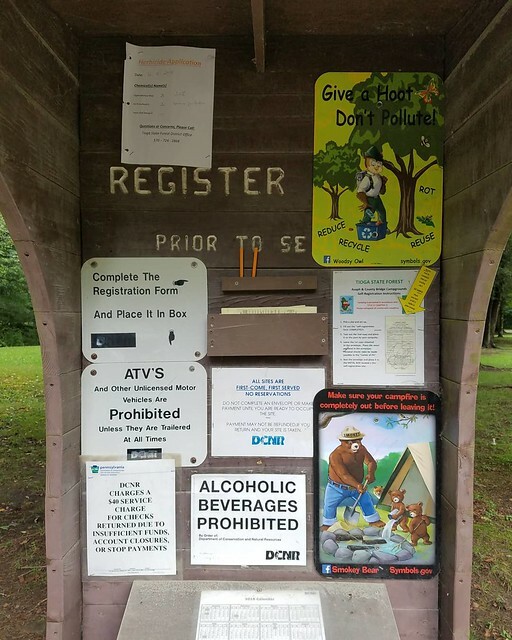 This small, scenic, and clean campground has about 14 sites set in the woods or along the Tioga River (which is the size of a large stream). Some sites can accommodate small RVs; all of them can accommodate tents. The sites are first come, first served, and there are no reservations. There is a self-registering kiosk at the entrance, water, and a bathroom. There are no showers. The cost is $10 a night. Across the road is a picnic area. 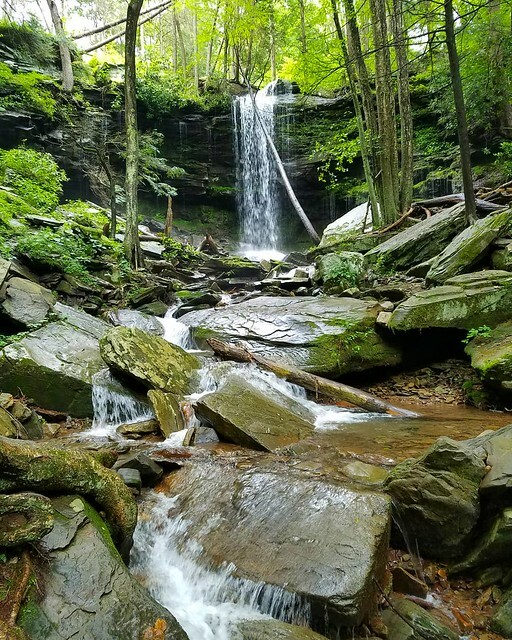 The campground is an ideal base to explore the eastern Tioga State Forest, such as Fall Brook Falls, Sand Run Falls, and Lambs Lookout. 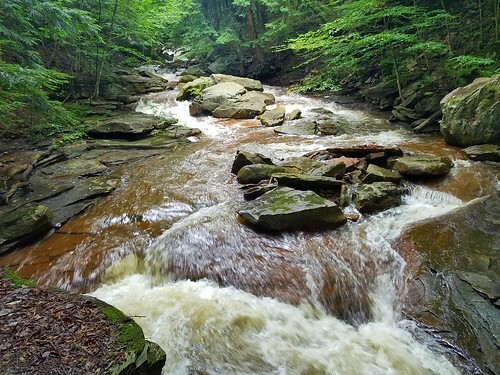 The McIntyre Wild Area and Rock Run, both in the Loyalsock State Forest, are a short drive away. The town of Canton, with stores and restaurants, is about fifteen minutes away. If you are looking for a quiet place to camp along a babbling river or in the woods, County Bridge is the place. 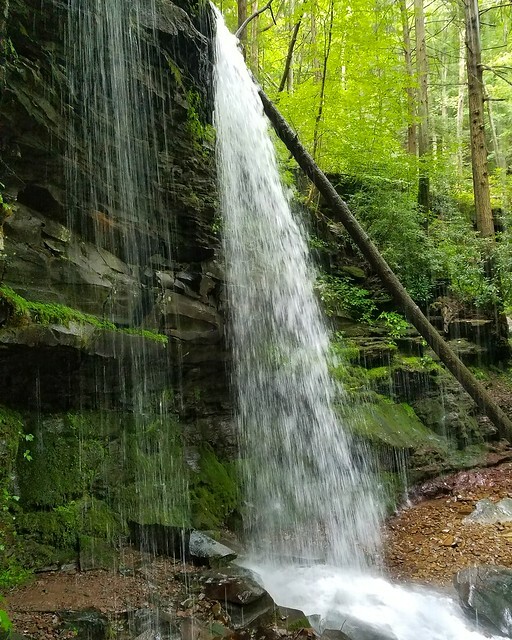 Fall Brook Falls is a beautiful spot in Tioga County. 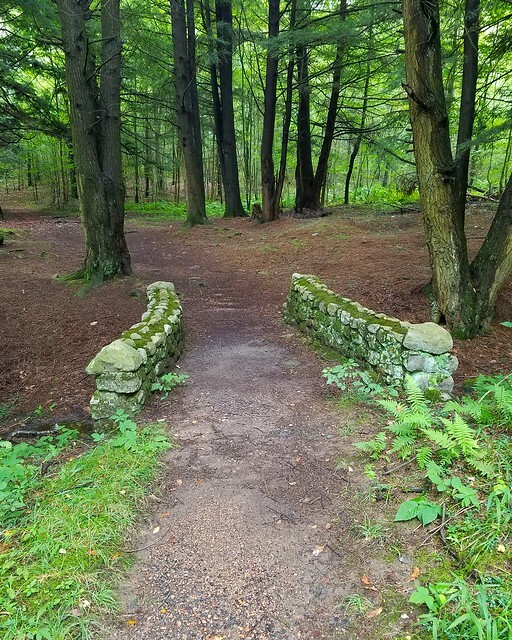 Once a well-known destination, as evidenced by a metal guardrail along the rim of the gorge and a quaint stone footbridge, Fall Brook now seems forgotten. 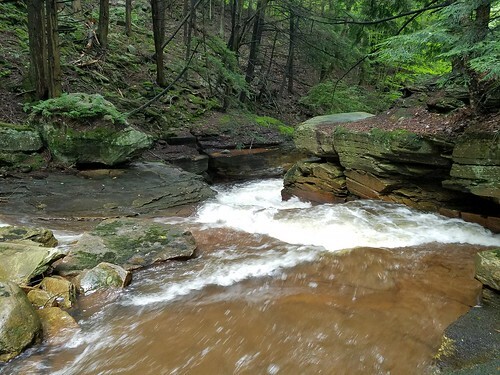 Here, Fall Brook tumbles through an impressive gorge, about 60-70 feet deep. There are two falls, slides, cascades, rapids and pools. 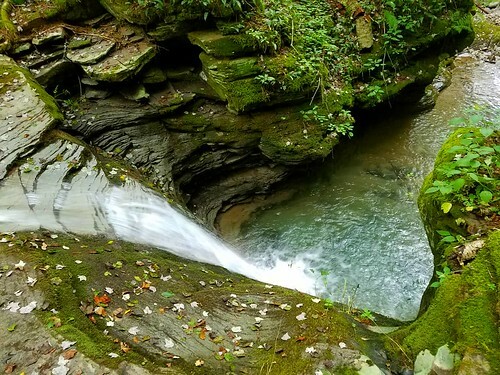 Cliffs and ledges surround the creek, and a seasonal falls flows on the other side. Hemlocks tower over the gorge. The creek used to be afflicted with acid mine drainage. Now, it is treated with limestone and the water quality is much improved. From the pull off parking area, walk the forest road back and then veer left across the stone footbridge. Enter a grove of hemlocks above the creek. 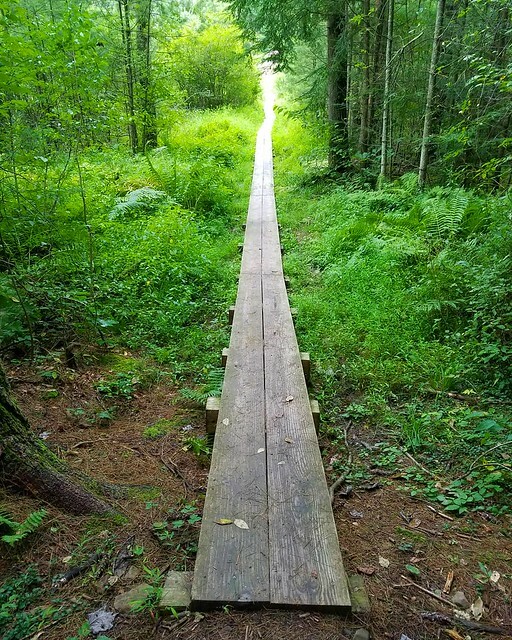 The trail is obvious, but it is not blazed or marked. A guardrail lines the top of the gorge. Look down on the first falls, a slide. It is hard to see the second falls since the gorge is so steep. Be careful walking along the edge of the gorge. 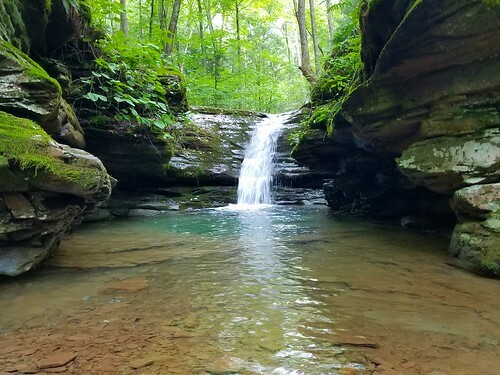 A trail descends to the creek at a slide and deep pool. To see the falls, I recommend you hike off trail and head upstream into the gorge. As long as the water isn’t high, this hike isn’t too difficult. Watch for slippery rocks. The gorge is very impressive from the bottom with the cliffs and falls. Stop at the falls, about a 12 foot drop into a deep pool. It is too difficult to climb above this falls. Return the way you came. The parking area is at 41.678956, -76.989407.